This head more than churches, bibles, and all the creeds…. Not one is respectable or unhappy over the whole earth…. doubt, despair and unbelief. How the flukes splash! with spasms and spouts of blood! But I know it will in its turn prove sufficient, and cannot fail…. Let your soul stand cool and composed before a million universes…. 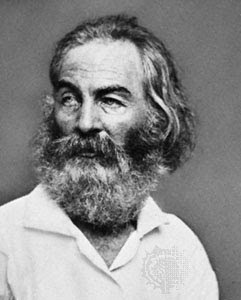 --Walt Whitman, "Song of Myself" in Leaves of Grass, (New York: Random House, 1993), pp. 66, 75,100-101, 110-111. We've got to get Walt Whitman and Epicurus at the same table! Dude had a way with words.